Winners of our IPHider account giveaway were sent their accounts just a few days ago and we have yet another free VPN account giveaway, this time quality VPN service provider ibVPN is sponsoring USA, UK, Canada, Germany, Netherlands And Ireland based IP anonymity supporting a variety of platforms like Windows 7/Vista/XP/95/98/Me/NT/2000, Mac OS X 10.2 and higher, Linux, iPhone, WM Smartphones any device/software supporting PPTP protocol. 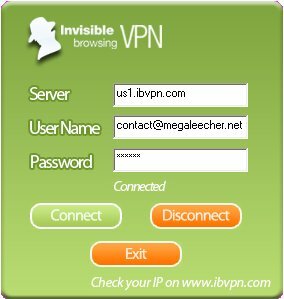 As usual the benefits of using ibVPN anonymity service is that you can surf the web invisibly and securely without being tracked bypassing internet-censorship and country specific content block. Although, no additional software installation is required ibVPN provides easy to use client configuration utility for Windows users and detailed instructions with images for all major OS and devices. To participate and get a chance to win a free vpn account simply Like this post on Facebook spreading the word out, click the "Facebook Like" button to start. and I don’t have an account. wer is the link...?? ?why dont u gv links 2 download? Still, I wish to be counted in this great ivVPN promo giveaway. They get better and better all the time, Keep it up. Useful program. Don't ahve facebook due to me actually getting up and visiting friends and not having long-distance friends. Though I like. Hi there, if you live in UAE, you should try Kongshar, it's also free and works with everything. Set up a free and safe VPN connection through provider Kongshare. - Click Start menu, Settings, Control Panel. - Choose Network and Internet Connections. - Click on "Create a connection to the network at your workplace". - Select Virtual Private Network connection (VPN). Click Next. - Enter company name "KongShare". Click Next. - Select "My use only" if you want this connecion to apply only to your user on the computer. Select "Anyone's use" if you want this connection to apply to all users. Click Next. - Check "Add a shortcut to this connection to my desktop". i live in Oman.here Skype is blocked.i am sercing free VPN.I have windows xp and 7 i need to installed free VPN. i have IPad and I phone also please send me the link for windows and Ipad. Last time i applied and i dint get any of the Giveaway..
request megaleecher atleast this time to send deatils. thanks and love ur website. Hi man, just added to my facebook and also send you email with my facebook username. Please, I need a german IP because I can't play an online game which requires only german or swizerland IPs. Hi I got a confirmation email from ibVPN. To confirm they asked me to comment here. I'm so happy to say that I'm a winner. Thank you MegaLeecher. You are rock. I love it. again thank you soooooooooo much. This is just to confirm that I got 3 month premium ibVPN. Thanks Megaleecher, you rock as always!!! Sorry to say that but I can't register an account by following the link to VPN site you given. It shows only shopping card ( I wrote them but not sure if they respond. Excellent! Thank you so much! Keep it up! Hi admin, just dropped in to inform you that now all is well with my ib vpn account. As I said I emailed to their support yesterday and today they helped me to create my account. Now I'm using this VPN ok, once again thanks both you and ibVPN service for this nice giveaway. Cheers! I got my 3 month too Thanks! Would love to have An trial/acc . Google for a list of VPN providers with servers located in Germany.Enjoy! - A copy of a photo ID (identification card, driver `s license or passport) of the PayPal account holder. - Proof of Valid billing address: Utility Bill. Just like every other country in the world, USA has also imposed its fair share of censorship policies and regulations on the digital content. Thousands of justifications have been given for growing adoption of censorship and geo-restrictions; but none of them justifies that the restrictions are valid. So, who faces the censorships? Only non-US residents are the ones most affected by these restrictions policies.